- SHENGHAI is the sole legal owner of the "ShengHai" trademark. The other sellers sell Fake Products or Imitation Products. - Please check the seller name before you purchase. Don't purchase other seller's product, cause you might get fake products or an empty bag. - If you purchased fake products from other sellers, you can apply to Amazon for compensation and rights protection. ★ Sizes range from 0.6-inches (1.5CM) to 2.1-inches (5.3CM); and all are 0.78-inches (2CM) high. ★ The 24-Piece Geometric Shape Small Cutter set includes 3 sizes of 8 shapes. 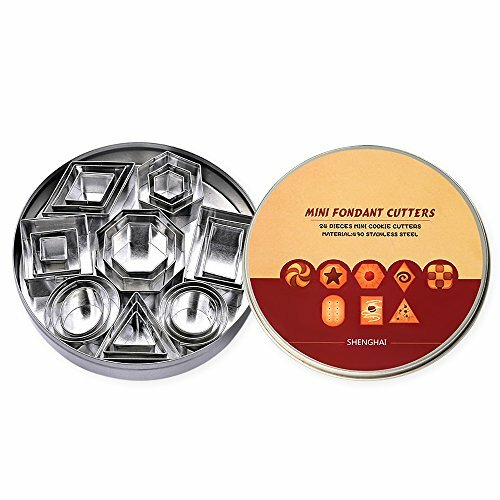 The Geometric Shapes Mini Cutters including Hexagon, Square, Circle, Oval, Octagon, Rectangle, Triangle, Diamond Molds. ★ SAFE FOR KIDS TO USE: The Mini Cutters have no sharp dangerous seams, plus thin blades cuts through hard + sticky dough with ease. - Great for forming Mini Food like Small Patties, Canapes, Hors d'ouevres or Fruit and Vegetable shapes. - Fun for crafting, you can even use these Small Cutters for your KIDS PLAY DOUGH! - CLASSROOM USE: Perfect for teaching kids their geometric shapes through crafts, clay and play dough. ★ Material : Food-Safe stainless steel. - Made of non-toxic food-safe stainless steel, means the Small Geometric Cutters will not rust! They're constructed to be long-lasting . - Non-sticky, easy to clean and dishwasher safe. To clean, just wipe under hot water and towel dry thoroughly. ★ PROFESSIONALLY DESIGNED: We have our own factories and professional molds, so the Small Geometric Shape Cutters set has higher quality and Less cost. - ★★★★★ New Packaging, Great Gift Idea. - 100% Satisfaction guarantee ! Professional quality set of 24 Geometric Shape Small Cutters. The Geometric Shapes Mini Cutters including Hexagon, Square, Circle, Oval, Octagon, Rectangle, Triangle, Diamond Molds for Mini Pastry, Fondant, Gumpaste, Donuts, Polymer Clay, Biscuits, Crackers, etc. NO MORE CLUTTER - 24 Pieces Geometric Shape Small Metal Pastry Cutters Set includes 3 sizes of 8 shapes. And it all fits into a compact storage tin taking up very little space. The tin box is safer than the cheap plastic box. PROFESSIONALLY DESIGNED with food-safe stainless steel. We have our own factories and professional molds, so the Geometric Shape Small Cutters set has higher quality and Less cost. ★★★★★ New Packaging, Great Gift Idea. VARIETY OF USES including cutting the perfect Tiny Cookies, Small Pastries, Mini Biscuits, Fondant, Gumpaste, Donuts or CLASSROOM USE - Perfect for teaching kids their geometric shapes through crafts, clay and play dough. ★ NO RUST.★★ DISHWASHER SAFE. Non-sticky, easy to clean. ★★★ Sizes range from 0.6 -inches(1.5CM) to 2.1-inches(5.3CM); and all are 0.78-inches(2CM) high. ★★★★ 100% Satisfaction guarantee ! If you aren't happy with your cookie cutters simply let us know and we'll promptly send you a full refund. No hassle and absolutely no risk on your part. If you have any questions about this product by ShengHai, contact us by completing and submitting the form below. If you are looking for a specif part number, please include it with your message.